In just under a couple of weeks, me and Steven are off on a little city break to Prague! So excited! It's become a little tradition of ours to go away over Easter, usually since it's near my birthday and I get the time off of uni. So this year we're off to Prague, if you have any recommendations please leave them below! 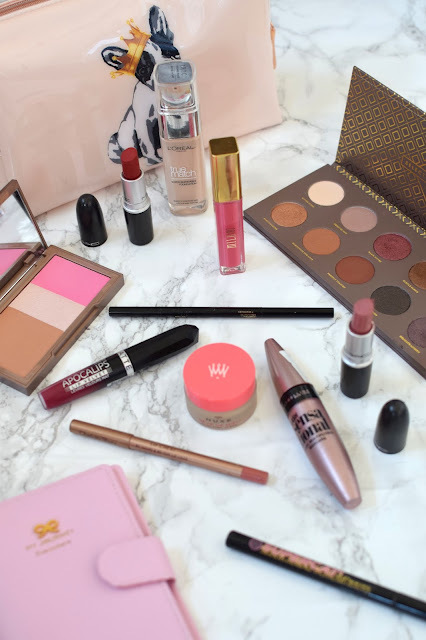 I thought I would do a little post on all the makeup products I'm planning on taking with me, we're going for 3 nights and are only taking hand luggage so I've tried to streamline as much as I can! I'm hoping to squeeze my skincare stuff into this Ted Baker case, which is super cute, the pooch looks just like mine! It's quite spacious, I'd definitely recommend it! So onto the products, I'm taking the L'Oreal True Match Foundation, I'm also taking the Collection Lasting Perfection Concealer and the Bourjois Healthy Balance Powder although I forgot to put them in the photograph! I'm taking the Soap & Glory Brow Archery and for eyeshadow I'm taking the Zoeva Cocoa Blend Palette. Sticking with eyes I'm bringing the Soap & Glory Supercat Liquid Eyeliner and the Maybelline Lash Sensational Mascara. I'm also taking the Urban Decay Naked Flushed Palette in Native, great for taking a highlighter, blusher and bronzer in one! For lips I've picked the Nuxe Reve De Miel Lip Balm. Also MAC lipsticks in Russian Red and Brave, the Charlotte Tilbury Lip Cheat in Pillowtalk, Milani Lip Gloss in Sweet Grapefruit and the Rimmel Apocalips Lip Velvet in Meteoric Matte. And that's it, I hope I don't forget anything, I usually do! Please let me know if you have any recommendations for things to see or do (or eat!) in Prague!